This article explains how one can access CAS tutoring resources. If you need information on how to add a CAS Tutoring activity to a Moodle course, please see How to Add a CAS Tutoring Activity. 2. Open the course page that contains the CAS link you need to access. 3. Click on the CAS link on the page. 4. Once you arrive at the CAS Online tutoring site, select the subject that you need tutoring for. Meet with a Tutor in a Live Session: Interact with a tutor in a one on one basis in the desired tutoring site. Ask a Tutor a Question: Send a question to a tutor for the desired tutoring center. NetTutor Study Center: Use library to improve learning experience. 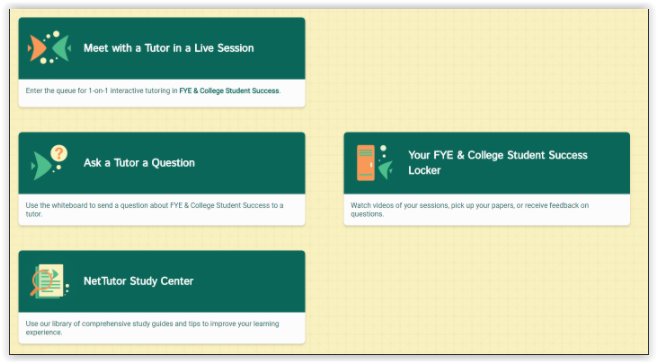 Your (tutor site) Locker: Watch past sessions or feedback from previous questions.